Enjoy different beers with your pizza. Photo courtesy Delancey Hollywood. Why don’t all pizza restaurants offer a beer tasting flight? 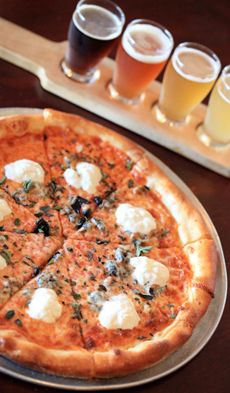 Delancey Hollywood has it right: a tasting of four different beers to enjoy with your pizza. If you can’t make it to Hollywood, create the concept at home. How about debuting it during the Super Bowl? Since most people don’t want to consume four entire beers with a pizza, buy plastic tumblers for shorter pours. The biggest challenge is what beers to offer. You can do a tasting of four different lagers or other beer types to compare brands, or mix it up: an ale, IPA, lager and stout, for example. We’re so into this idea, we’re going to have it for lunch today. Now, the second biggest challenge: What type of pizza to order?